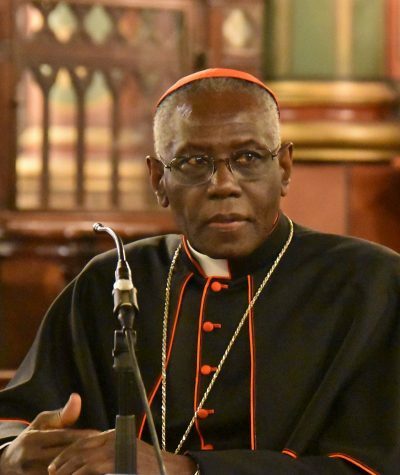 In what will surely to be considered a highly controversial statement, Vatican cardinal Robert Sarah, has stated that Catholic priests can use genetically modified bread during the Eucharist – but not ‘gluten-free’ bread. In an article in the Guardian online* Sarah is quoted as saying that guidance was needed now that Eucharist bread can be found in supermarkets and even over the internet. Somehow or other, in giving the OK to the use of GM unleavened bread, this statement encapsulates everything which is antithetical to basic, informed wisdom – never mind spiritual guidance. To deliberately distort the composition of the genetic code of life, is to go against the principle of reverence for the species. Doubly so since this is only undertaken to increase the profits of the corporations that patent the engineered plants. The cardinal then states that such bread should only be made by people “distinguished by their integrity.” Well, well, clearly the Vatican has a whole other concept of what ‘integrity’ means, than I do, and indeed millions of others. The article is capped-off by the statement citing Catholics’ belief that the bread and the wine issued to the congregation during communion, symbolizes the body and blood of Jesus. Even to take this in a non literal sense, raises severe questions about the origins of this ritual. Nobody needs to imbibe the blood and body of Christ, even symbolically, in order to gain support from divine sources. Rather the opposite, to believe it is necessary to engage in a ritualistic form of cannibalism (however disguised) in order to receive divine blessing, places a block on the ability to see the sacred in everything. Rather it encourages a return to the dark ages of sacrificial worship. I do not wish to cause offense to Catholics, especially those who follow their conscience, but the church has made it plain for all to see, that it is following a whole other doctrine than the one which supports nurturing an increase in spiritual awareness. We are witnessing a false dogma laid bare; and, in a sense, we should thank Sarah for so brazenly exposing this fact. For the sake of brevity, I am going to resist going into every hypocritical nuance which the Vatican proclamation raises. Others have covered in depth, the prevalence of dark guidance which flows through this institution. But one cannot help but feel a shiver of horror when one links together the hundreds of cases of priestly pedophilia, the sacrilegious ingestion of symbolic body and blood and the promotion of GMO. There is much more, but these three are quite sufficient in alerting all of us that it’s time to stand back and see the bigger picture. A great swathe of the world’s activities are run from the Vatican, in its link-up with Washington DC and The City of London. None of which are government or citizen controlled. They are tax-free ‘corporations’, boasting their own private police forces and independent status from the rest of society. Here is where the hierarchical sudo-elite devise their ‘new world order’ ambitions. Their plans to take control over all aspects of planetary life. They work closely with the international banking cabal and with heads of state. They comprise the top end of the 0.2% pyramid elite whose ethos is to dominate within the construct of a totalitarian world, in which all those ‘below’ act as their minions. There are many good and thoughtful individuals who follow the teachings of the church. Likewise there are priests performing valuable supportive efforts to those under repression all over the planet. Throughout the world 70 to 80% of individuals are against the use of GMO in the food chain. They perceive, in spite of mega bucks worth of corporate attempts to sell the GM message, that this laboratory inspired experiment is a dangerous and crass distortion of nature, with historical links to Nazi programmes promoting genocide. They also deeply distrust the agrichemical corporations trying to market it. Who is right: the church and the corporations or the people?